China is going to build a $242 billion (1.5 trillion yuan) high-speed rail link between Beijing and Moscow. The line will cut the journey time from five to 'two days', say Chinese authorities. The railway will be 7,000 kilometers long and go through Kazakhstan, reports Bloomberg citing Beijing’s city government on the social networking site Weibo, China’s alternative to Twitter. The railway will make travel easier between Europe and Asia, the statement said. 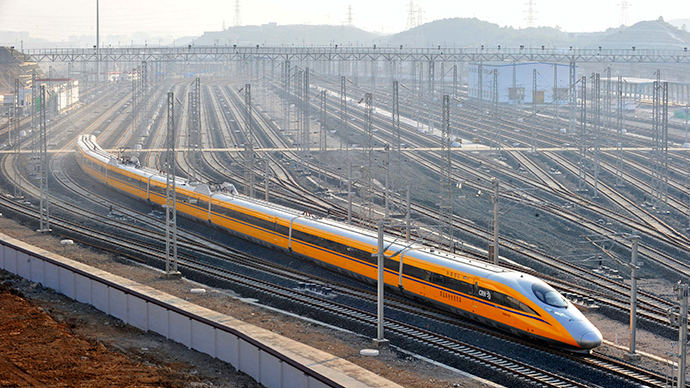 China is actively promoting its high-speed railway technology and sees Russia as an especially attractive market because of its strained relations with Western countries over Ukraine. In October 2014 Russia and China signed a memorandum of understanding over a high-speed railway connection. Russian Railways then reported that its purpose was to plan for a high-speed Moscow - Beijing Eurasian transport corridor. The project was more interesting because of the $400 billion deal signed in May for Russian gas giant Gazprom to build a pipeline and start gas supplies to China. First Vice President of Russian Railways Alexander Misharin said in November that the plan would cost $60 billion to reach the Russian border and that the journey from Moscow to Beijing could be done within 30 hours. The fastest route currently takes at least 5 days.